The plan was for the Zooma Annapolis Half Marathon on June 1st to be my next big event. But, since I had already completed my 12 mile long run, I decided that I might as well run the Brooklyn Half as a training run in lieu of the 14 mile long run on my schedule. So I registered for it two weeks before the race. It had previously sold out in one day but New York Road Runners reopened registration and began marketing it as a marquee race. As the race approached I started to get nervous about it, especially because I struggled through a 10K the week before and because it would only be my second half marathon. Before I knew it, race morning was here. The plan was to take my time, try out my strawberry flavored Chomps and new playlist and have fun. 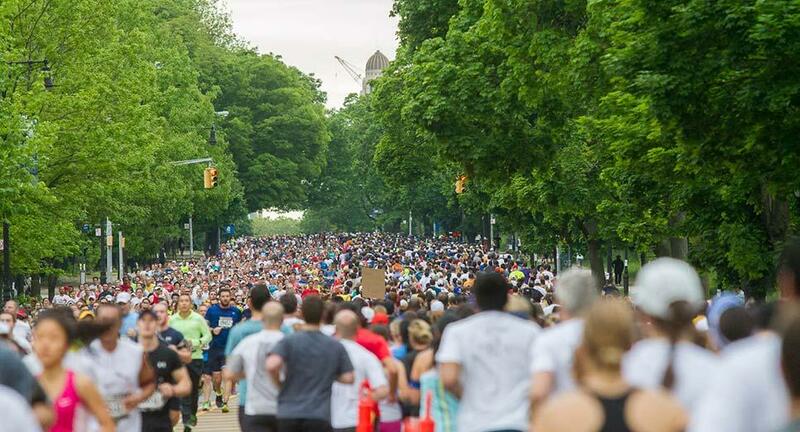 The course ran from the Brooklyn Museum on the corner of Eastern Parkway and Washington Avenue, around Prospect Park, down Ocean Parkway and finished on the Coney Island Boardwalk. My main concern was getting through the Prospect Park portion of the race. I am fast learning that the word “Park” is racing code for “Hills” and we know how I feel about those. After the hubbster dropped me off, I went off to find bag check and my corral. There were people everywhere. This race was massive but the sun was shining and there was a great energy. When I finally made it to my corral, which seemed to be a mile away from anything constructive, I decided to line up for … Oh Yeah … the Porta Potty. Since I had tried to hydrate like a champ the day before and had been sipping water all morning, this visit was not negotiable. For security purposes, the Potties were inside the corrals. Let me tell you, my corral time was not the most pleasant experience as those throne rooms were stinking up the joint. We were lined up with our shirts over our noses. I got in and out as fast as I could and prayed that would be my only visitation for the day. Oh and here’s a tip. Always, carry a few squares of toilet paper with you. A guy who was two people ahead of me announced that our Porta Potty had no toilet paper and proceeded to look panicked. I had my little stash but started to fret because a man needing toilet paper means only one thing … enough about THAT. There were two starting waves. I was in the second wave and we started 35 minutes after wave one. There were so many people it still seemed to take forever to get to the start after our gun went off. When we finally crossed the start, I realized that my corral mates were near sprinting and I was running right along with them. I slowed down and tried to keep a responsible pace but I was still running faster than I planned. Then we turned onto Flatbush Avenue and headed up to Grand Army plaza. Now I have driven this road countless times and never once noticed that there was a steady incline. Well my legs certainly took notice now. Check it out. As we approached Grand Army Plaza Sylvester’s “You Make Me Feel (Mighty Real)” gave me an extra push as did the cheerleaders at the Plaza. A couple of the male cheerleaders were emanating a Studio 54 vibe while Sylvester was singing in my ear. This was a great moment and I waved and whoo-hooed at the cheerleaders. Good times. Before I knew it mile three was done. We entered the park at around mile three and a half and yes there were hills. There was one particularly menacing hill that just kept winding and bending so you couldn’t see an end in sight. Anyway, when I hit mile four a bunch of guys from a local running club started chanting “four down and nine to go” and that army thing “I don’t know but I’ve been told … sound off, one two …” Then they broke off and started running really fast in between the runners encouraging everyone. It was a wonderful distraction. The next memorable moment came at about mile five and a half. I ran into a guy who was singing Sheila E’s “Glamorous Life” obnoxiously loud. Awesome. I sang with him for a little while, “Without love, it aint much, it aint much.” He had the nerve to look at me like I was crazy. More good times. At mile seven and a half, I ran out of the park in a blaze of glory. Ding dong, the park was done. 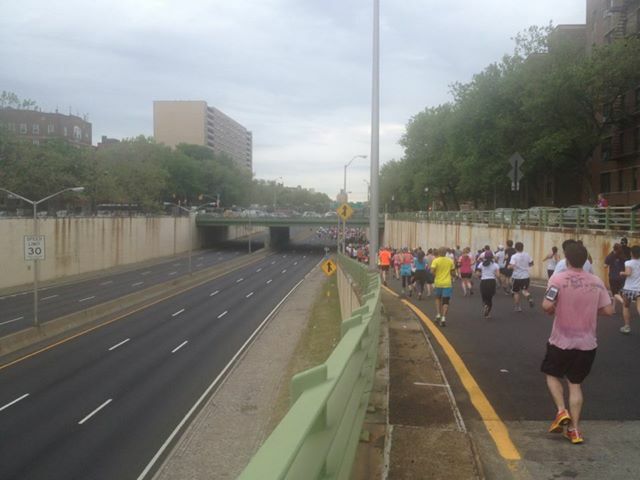 The picture above shows runners on the entrance ramp to Fort Hamilton Parkway (at least I think that’s where we were). It was pretty cool to see a Brooklyn Parkway with no traffic. I couldn’t wait to get on it. By this time, the sun was no longer shining. It was cloudy and nice and cool. In a blink, I was on Ocean Parkway. I remember looking up and seeing the sign for Avenue C. I realized that I was starting to feel a little tired. At mile eight, they were handing out Gu at the hydration station. I had one of my Chomps instead and washed it down with a good helping of water. There were 11 fluid stations and I hydrated at all but two of them. After the Gu station, the ground was sticky for a while. So in addition to being tired I had to peel my feet off the ground. Ew. When I passed Avenue G, I thought, “Well at least I’m getting somewhere.” Then of course I realized that I was getting nowhere because the next street was not Avenue H. It was some arbitrary randomly named street. I was annoyed. It felt like forever before I got to Avenue H. I decided “H” was for Hallelujah! At mile nine I was really tired and my legs felt heavy. Ugh. Then, BOOM! Like a mirage there appeared four or five Black Girls Run members on the side of the course. I didn’t know them but they cheered for me like there was no tomorrow. BGR rocks. I got my second wind. I was having a good ole time as I passed mile ten and headed towards eleven. But as I approached the mile 11 hydration station I was near limping. My left glute (or some muscle back there) was killing me and a toe on my left foot was hurting. Bad times. But at this point I had only two miles to go and so I kept at it. At mile 12, I stopped at the hydration station, I did the grab and run through the others. I made sure I got a good drink of Gatorade and Water because it was the last fluid station before the finish line. soon after, I recall seeing the 800 meter mark and decided that I hate the fact that they feel the need to place a marker there. It’s just too far away to get excited about almost finishing. I decided to save my excitement for the 400 meter mark and I was completely psyched when I saw it. I got a little extra pep in my step. It was the equivalent of one lap around the track and I could do that. 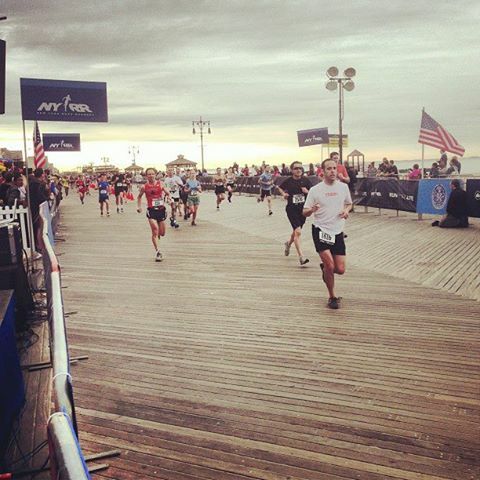 Soon I was on the boardwalk where there was a nice crowd of spectators and could see the finish line. Check out the boardwalk. What a cool finish. I crossed the line and sought out my medal because after all, it’s all about the bling. I wound up running the race harder than I should have, considering it was supposed to be a training run. But a race is a race, right? I was pleased with my time of 2:21:07. This was my second half marathon and I ran a PR. So I was feeling really pleased with myself until I had started to walk down the steps to exit the boardwalk. It was bad folks, I let out quite the yelp. Holy soreness!!! I was a little nervous going into this race. Let’s face it, I’m nervous at every race. When I got up it was raining and so I wasn’t super excited about that. My rain gear consists of a brimmed cap, period. I had a banana and some water for breakfast. That’s as much as I can stomach before a race. You are not supposed to deviate from whatever you’ve been doing on your training runs when going into a race. However, I do most of my training runs on empty, which really can’t be a good thing. So, I sometimes I do the banana thing because I know I’m supposed to fuel the tank before a run. I’m still working on my running fuel. Speaking of fuel, I tried out Bikram Yoga the day before the race. I knew that was a risky proposition but I’ve been wanting to do it for so long and I was up early enough to make it, so I went. It was cool, well not really cool because they heat the room to 105 degrees. But it was an interesting experience. Who knew stretching could be so strenuous? I was dripping sweat early in the session. Due to the yoga water loss, I tried my best to rehydrate during the course of the day and decided that I would stop at all the hydration stations during the race. Otherwise, would probably only stop at one or two for a 6 mile run. 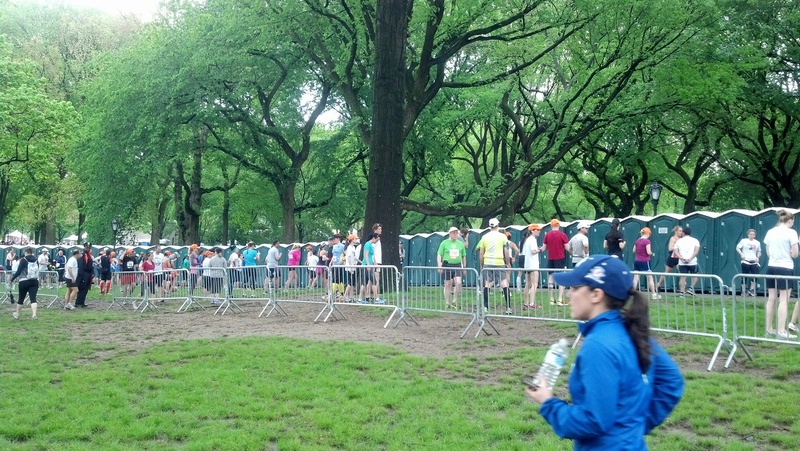 Yes, an obscenely long line of porta potties. I could immediately hear angels singing and all was well in the running world. If you’re around runners long enough, you’ll realize that runners can get obsessed with porta potties … they are our friends. My personal feelings toward porta potties could be described as a love/hate relationship and so I was thankful that I didn’t need to make a visitation. Race corrals sort the runners so the fastest runners are in the front and the slowest are in the back. My corral was so far back that they didn’t even put out a number for it. So, I went to the last corral and waited for the gun, which occurred right after the national anthem was sung. I think the singer of the anthem may have been having a bad day. That’s all I have to say about that. Then the race began. When we finally crossed the start line, the woman in front of me saw family and/or friends cheering for her and decided to stop and cut across to greet them. There is always one. This happened during the Scotland Run but I have to say that this race was not congested like that one. Maybe they made the running lane wider. After getting by the greeter, I was off to a good start. I was feeling great and oops, I missed the first hydration station. It was less than a mile out and by the time I saw it I was too far to the right to cross over and safely get water. No worries, I was having a wonderful time and figured this is probably how Mo Farah feels when he’s running but decided to run closer to my left so as not to miss the other stations. Cat Hill was conquered and I caught the next hydration station and before knew it mile two was completed. At this rate, I was looking at a PR. I was a little hot and sweaty and considered tossing my hat. No chance. I paid good money for that. But I felt like my form was good and was picturing myself bounding along like a gazelle and then … stop the presses. Before me was the ugliest hill ever. As I started to tackle it, I thanked God that I stopped at he last station. Then I realized that what I thought was the top of the hill was not, it just seemed to keep going and going. Then, I saw a woman about 50 meters in front of me throw up her hands in victory. At this point I’m dying and I’m thinking, “Does this idiot not realize that we still have almost four miles to go?” Then it dawn on me that she was celebrating the fact that she had finally reached the top of the hill. I was encouraged and kept going and sure enough I too was on top of the world. Yay, turns out I had just run Harlem Hill. I tried to enjoy the downhill but I was so wiped from the climb that even that seemed hard. I started to get my legs back and BAM, another hill. At this point, I realize I am sweating like crazy and I am not liking this race. By the time I got to the third hydration station, I walked through it and made sure I got good drink. I had a hard time getting my running rhythm back, which is why I don’t like to stop a the hydration stations and if I do I try to keep running even if it is at a much slower pace. And of course there were more hills. I passed quite a few people who were walking. I was almost at mile four when I got to the fourth hydration station and I walked through but got most of the water on my face anyway because I just didn’t have the energy to focus on swallowing it. Mercifully the next mile wasn’t so bad but by this time I was so tired and was mad at myself for the whole Bikram yoga thing. I didn’t even see the five mile marker but I did stop at the fifth hydration station. I was probably delirious. I remember seeing the 800 meter marker and equating it to twice around the track. Quantifying that way just made it seem more attainable. When I finally crossed the finish line I started to feel light headed. I grabbed more water and wished it was Gatorade. A guy told me to take a bagel and said it tasted like French toast. I nibbled on the bagel. The guy lied. I managed to retrieve my bag from the baggage check and broke out my trusty chocolate milk. Bye, bye bagel. The milk was still cold and just a few sips hit the spot. For me, there is nothing like chocolate milk for post race recovery. I was still thirsty for Gatorade and remembered that I had a six pack in my trunk. I whipped out the GPS to figure out how to get out of the park and that’s when I realized that even after all of that pounding my achilles felt fine. Maybe Bikram wasn’t such a bad idea after all. I just won’t be doing it the day before a race. Turns out humidity was at 97%, so maybe all that sweating wasn’t from the Bikram class. 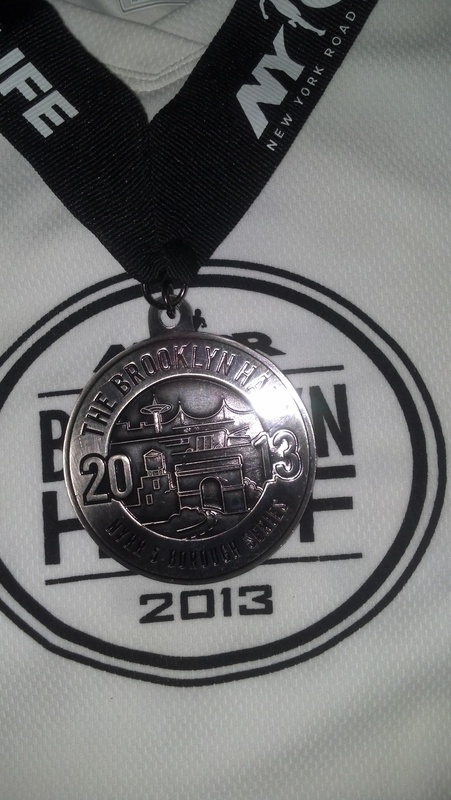 Next stop: THE BROOKLYN HALF MARATHON on May 18th … yes next week. And yes, I’m nuts.